Folks, it's that time again for a break in our story. The strawberry fields are ready to be harvested and while Elsie, the kids and I tend to that, we will also be preparing the next chapter in the Sigley Family Saga. I promise you, there are many more stories to share with you. I purposely left out this installment in our family saga because this has been a chapter of celebration, births and the convergence of all the wonderful clans who joined the Sigley family tree and have made it not only stronger, but varied in it's fruitful beauty. Still happy from recalling all those wonderful events. Elsie, ever the dutiful wife; however, reminds me how in the not too distant past, we suffered a great loss and rightfully insists that to the chronology of our story I add the following. Together, we now recall what a sad New Years it was for us when we ushered in 1917. When we got this letter, Elsie and I sat down together to read it since so often letters from New Jersey reported sad news. This one was one of the saddest. In just a few lines, Cousin William told us how dear Aunt Alice passed away on November 28th,1916, almost a month to the date of his writing. If I haven't said so earlier, I am remiss, but I am truly grateful to have this venue to reminisce and chronicle our family events and times--the good and the not so very good. A man of very few regrets there is one that now comes to mind. How I wish I had realized then how the fates were developing families that would join ours and that I should have eased poor Cousin William's sadness and assured him that he and his brother Arthur were not only not the only ones left, but that our family would grow and continue to leave its mark in all directions of our wonderful country. I owe Mrs. Sigley a respite from my project and she reminds me that my assistance is required elsewhere, but I will return soon. It took another research team, headed by Jason, and their efforts to bring this entry to life. Whatever else we're going to say here is prefaced by a heretofore unseen claim in our family tree. The branch that will be introduced here dates back as being in the United States since, at least, 1726 when Samuel Jackson is listed as living in Larne, California. 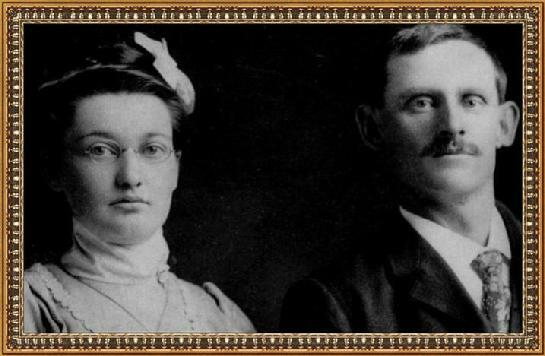 The son of Irish parents, Joseph Jackson and Elizabeth Vance of Fergus, Antrim, Ireland. Further found are Elizabeth's lineage. Her parents John Vance born in 1650 and her mother Mary Williamson, born in 1162 were from Tyrone and Antrim in Ireland, respectively. Through the generations the Williamsons, Vances and Jacksons eventually joined the Robinsons when Margaret Jackson married James Robinson. It is with them that we have a not so arbitrary starting point of reference--the Morgan County, Illinois 1880 census. Here we find them with their family--three young sons, Silas, 9, Theophilus, 3 and O. William, 5 months. 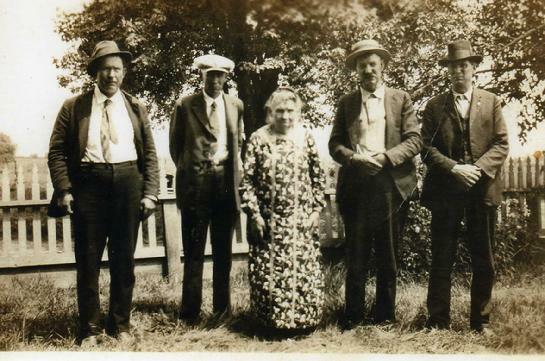 The four brothers held jobs in farming (as sharecroppers) and the railroads�the typical occupations of the time. It was Silas R., the eldest, who was somewhat of a wheeler-dealer with many financial interests. 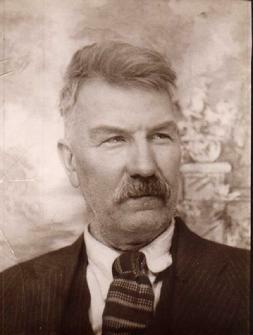 He married Isora Evans, who longed to leave the rural country life but they continued in the family�s farming tradition. 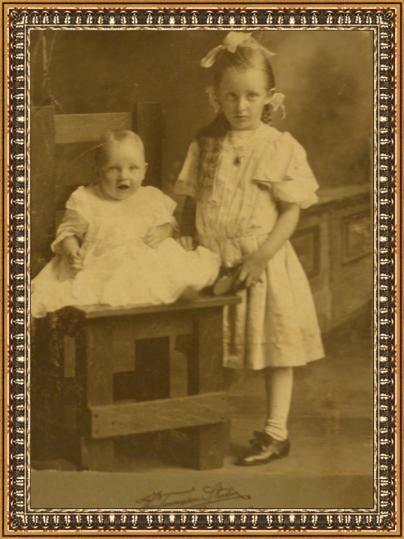 To them on August 12, 1919 was born Thelma Lorene and her twin, Velma. As Isora was also a twin, history repeated itself with the birth of these two girls. With Thelma in our story we now have finished up a good sized corner of the puzzle and rounded up a generation's worth of relatives. I am now prepared to propel our story into more modern, although certainly not any more important times. I'm on a roll and could go another two or three instalments tonight, but Elsie is pulling me away. That's just as well since the next is not an installment I'm anxious to write. 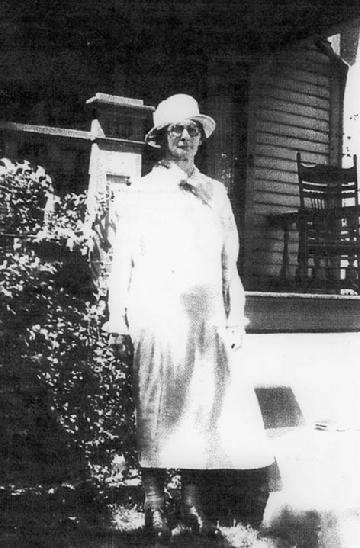 Editors Note: Without the findings of Jason's extensive research, this entry would have simply announced the birth of Thelma Lorene as, though contemporaries, the Robinson's history is somewhat mysterious. Isn�t it curious how fate has a way of bringing people together without their knowing how they will affect the lives of others? As our story continues, we find this to be the case of one particular family of the many thousands who migrated to the United States hoping for a better future. We pick up this family�s story in1901when twenty-three year old Silvestro left his home and loved ones in Pietrastornina, Italy, where he lived after relocating from his birthplace of Avellino, and journeying alone, came to the United States for the first time. He sailed into New York harbor aboard the S.S. Gallia, proudly became a naturalized American citizen, and married Anna (Editor�s note: To date, we do not know Anna�s maiden name). He returned to Italy for a visit and told of his travels and life in America. In 1906 he sailed back aboard the S.S. Germania and settled in Port Reading, NJ. Tales of Silvestro�s new life sounded so alluring to his younger brother, Francesco, that in 1907, Francesco and his wife, Rosaria, made the journey from Pietrastornina to Napoli, boarded the S.S. Nord America, and were met by Francesco and Anna in New York. With the promise of The American Dream driving them, The Barbatos had arrived in America. Follow the young Barbato�s journey with us as illustrated by these documents. Francesco and Rosaria became Frank and Rose, and along with their children exemplified the typical immigrant New York family. They made their home on Sarah Ann Street on Staten Island and, as a laborer, Frank took work where he could get it. Editor�s Note: While so much changes, some things, sadly, stay the same. While researching Sarah Ann Street we found the street�s name had changed to Van Duzer and also the following disturbing article which is quite reminiscent of our own John Logan�s work as a social correspondent. The years passed and the family grew, Frank moved his family to Montgomery Street and he worked as a coal shoveler on the Staten Island Ferry and Rose kept busy at home tending to their children. Like so many other proud Americans, Frank, along with his brother, Silvestro, did their civil duty and registered for the draft for the War. Ten years after arriving in the United States, Frank and Rose�s American dream was well on its way and on October 19, 1917, their sixth child was born. As fate would have it, unbeknownst to anyone, Salvatore Barbato would have a lasting influence on the Sigley family tree. The daughter of Irish immigrants, Georgina Harriet Deacon, born on May 17, 1891 married William Henry Ulrich who was 2 years her senior on New Years' Eve 1912. And a Happy New Year it was indeed. Harlem was then very much what it is today--a fragrant cauldron of steeping cultures. Whatever else might be happening in the world, here the colorful masses worked and played together and segregation was one of financial and racial differences. As the 1920 census illustrates, economic status divided society more than ethnicity did. But sadly, segregation there was, and what the census does not tell you is how three years prior, in 1917, the first massive African-American protest took place in their neighborhood when 8,000 to 10,000 blacks marched down Fifth Avenue in a silent demonstration against the recent Saint Louis riots and appealing to President Wilson to address lynching, mob violence, disenfranchisement and Jim Crow. This demonstration is viewed by many as the start of the Harlem Renaissance, where the Ulrich family would reside for many years to come. That the young Ulrichs lived this in their own neighborhood is of very special note since, as we've learned, many Sigleys have throughout our history been intimately involved in the fight for these rights. Indeed, yours truly lived for many years in the capital of the State whose most famous son fought and died to end these injustices. A battery man by trade, William "Willy" Ulrich worked for General Seal Battery Company at 1675 Broadway in the heart of Times Square. A true New York family, they raised their children amidst the world travelers that frequented Manhattan year round. The harmony of their young home was threatened by World War I and, when completing his draft card, Willy requested exemption since he was the sole support of his wife and two children at the time. For our story, it is one of these Ulrichs and Deacons in particular that will enable the tree to grow to present times. For now, she was just Willy and Georgina's baby girl who, much to their joy, joined her parents and two year old brother James. Emma Marie Ulrich was born in Harlem on April 17, 1916. Much is known about her and new stories, thankfully, continue to be told by those whose lives she was to share and who would view her as a loving and strong matriarch. Fortunately, although I did not have the pleasure of meeting them personally, their documents tell their story fairly vividly. With additional facts provided by what is today common knowledge to our decendants, I can delineate their milestones. On March 14, 1907, in Cerignola Italy Pietro Chiomenti Married Giovanna Constanza. At 27 and 22 years of age, respectively, they began their family with a daughter, Antonia, in 1910 and Pasquale in 1912. Both children were named after Pietro's parents. A year after Pasquale was born, Pietro left for the United States and it was a long two years until Giovanna and their children joined him. Their travel records show a typical immigration into Ellis Island, he on the Indiana and she on the Sant' Anna. The Sant' Anna was in service from 1910 until May 10, 1918 when she was torpedoed and sunk in the Mediterranean. I don't know how much money grandfather Sigley (formerly Garner) had when he emmigrated, but Pietro had $28 dollars with him and this, according the the passenger manifest, was more than most passengers brought with them--about $25 on the average. On March 26, 1916, Leonardo, named for Giovanna's father, was born. Two years later his brother Michele was born and two years after him, Giacinta named after Giovanna�s mother, rounded up the Chiomenti Constanza clan. They lived at 1968 Richmond Road in Staten Island and, pun intended, they cemented their clan in that fair borough. Pietro, a carpenter by trade when he came from Italy became a self employed mason and made a good life for their large family. This information is gathered from this World War I and World War II Registration cards. As we move along in years and the milestones built up, the 1930 census shows their home on Fremont Avenue in Staten Island valued at $8,000 while other homes ranged from $2,500 to $6,500. A young man with $28 dollars in his pocket arrived in a strange world that even spoke differently than he did. To forge their way he left behind his bride and their two babies. From that beginning, 17 years later Pietro woke up many a morning satisfied that he had peacefully dreamt, the American dream. Nearly one hundred years after the first European contact with a little island near New Jersey by Giovanni da Verrazzano in 1524, Henry Hudson established Dutch trade in 1609 in the area and named this new place, Staaten Eylandt. Years of establishing towns and battles during The Revolutionary War are but just some of Staten Island�s rich history. In 1898, those towns and villages were dissolved with the consolidation of the City of Greater New York and The Borough of Richmond (as the island was officially named until 1975) became one of its five boroughs. The Civil War found great unpopularity in a little community located on the East Shore of Staten Island known as Frenchtown. In spite of that disapproval and the fact that the island was rife with anti-draft riots, Frenchtown was renamed Grant City in honor of General Ulysses S. Grant in 1863 with several streets being named after historical figures, not the least of which is Fremont Street, named after General John C. Fremont, the first Republican presidential candidate. And it is in this new community of Grant City, that my narrative takes a turn to cover the story of another immigrant family, different from the Sigleys in many ways, yet also similar. Do I confuse you? Then, let me explain. Similarly they left their home in Europe, Italy to be exact, in search of the promise which the United States offered. Just like us, they became part of the fiber that was woven to create our colorful country. The color this particular family brought, much like their home country, was the color of romance. The main players, Pietro and Giovanna, are another main cornerstone while our family story widens to include the families that helped us to strengthen our communal bloodline. While new to the United States by comparison to the Sigleys, O'Connors, McCluskeys, Finks and the rest of the already established families in our story, without the Chiomentis and Constanzas, our story would certainly be different. With them, we all became us and the clan diversified and became richer for it. We made our home in the burgeoning town of Farmersville, that had been surveyed and laid out in 1893, while the Illinois Central Railroad was being built. Farmerseville was to witness the raising of our children and our hard but proud farm work that was, like most of our neighbors, our livelihood. A little more than two years had passed since Elsie and I contentedly enjoyed our blessings when Mary Alice was added to our growing family tree . Then, on August 22, 1912, we welcomed the last limb into our lives, our second boy, Karl Logan. I want to point out that Karl was left-handed. A fact that may seem unimportant now, but one that will be relevant as his story continues. Our Farmersville, Illionis home, Karl Logan's birthplace. Our Sigley clan was a good match to the growing, young town, the most important in Bois D'Arc Township, and along with it, we prospered. Of all our children, it was Karl Logan who was to leave a true legacy of our bloodline's historians. Although many of us left stories, quips and mementos to be discovered, saved, deciphered and shared, it would be his direct decedents that would coax me to tell you this story. 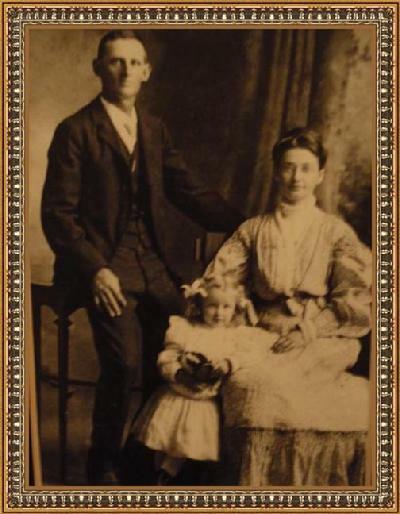 Thelma was 7 and Bruiser Roy 2 and a half when our Mary culminated Elsie's and my most happy family on July 8, 1910. In a year marked by two great events, the first one being the surprise appearance of the Daylight Comet in January. A comet even brighter than Halley's Comet, which made it's predicted every-76-year return in April of that same year--nothing was brighter in our lives than the birth of our baby. As I continue chronicling our family history, you will understand why I always felt these two major events presaged the importance Mary would hold in the lives of many a Sigley. Her intelligence and physical beauty were just a part of her parent's pride and joy. Few of us were held as dear, led as bright a life or would be missed as much. 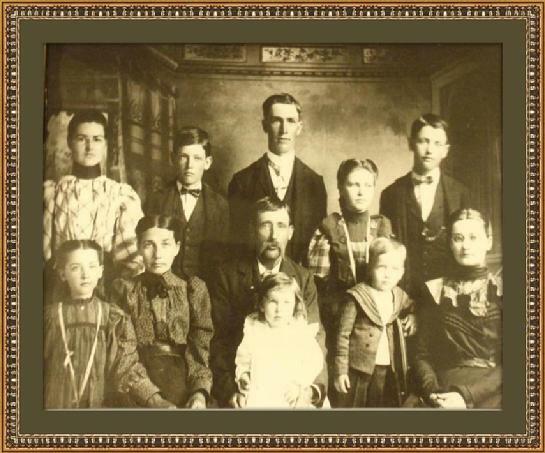 The following documents, all from the 1910 census, show how Aunt Sarah and Aunt Alice�s side of the clan established the East Coast side of our family�the McCluskeys and the Finks. My cousin Arthur remained at home with Aunt Alice. My widowed Aunt Sarah, was living with her daughter, my cousin Ida, who was also widowed and had two daughters, Ella (15) and Mildred (12). Cousin Arthur and his wife Amanda made a home with their two children, Alice (6) and Arthur (4). As we welcomed Mary into our young family, our New Jersey relatives continued their lives in Belleville. You must imagine how when letters arrived from New Jersey, we often cringed. As excited as we were to hear news from our Belleville relatives, so often it was news of the worst kind that these letters were always opened with much trepidation. Three years after Uncle Arthur McCluskey died, a letter arrived from Cousin William announcing his brother, Cousin Walter's, sudden death at the age of 29. It is evident, as you read through the following letter, Cousin William, in his bereavement, is short on words. He did write that two doctors and a nurse attended poor Cousin Walter to no avail and how he succumbed to pneumonia in only one week after it's onset. This raises a few possible scenarios. Aunt Alice was either well off enough to afford this medical help or she did as most mothers would, she got her son as much as she could to help him heal. That the disease took over him so violently that he died in a week reminds how, even to the present age, it's effects are still the cause of many a death. I know that Cousin Walter would not mind me repeating what I've often heard from his and my descendants when referring to the way people die. They say "He died in a very popular way." We need to backtrack for just about half a year. While Elsie and I awaited the birth of our second child, Roy, hard times befell us and I was in ill-health. So much so that this installment's accompanying document, a letter from Aunt Alice, was sent to me in care of St. Francis Hospital. How Elsie dealt with a young Thelma in her fairly advanced state, is a good commentary on the strength and fortitude she would pass down the Sigley-O'Connor bloodline. Reading over the letter now, I recall how our family in Belleville, New Jersey were braving their own hardships and were suffering numerous deaths. So distressed by what she was about to share, note that Aunt Alice addresses me as "Dear Cousin" in her salutation. As you will read in the letter below, Aunt Alice goes on to say how her husband, who she addresses as "Father", had died. I'm sure she calls him this, not out of confusion, but as a common term of endearment of the times. She tells me how it has been a terrible winter that's kept the doctors very busy and that days after Uncle Arthur died, Clement Dickinson, cousin Ida's husband also died, leaving her a young widow and you can imagine the suffering. Luckily my Aunt Sarah, also widowed from Silas Fink, was living with her and was a great comfort and help with her two young children, Ella and Mildred. While it was so long ago that I don't remember why I was hospitalized, suffice it to say that I recovered. You know how when you're trying to remember something you forgot the best thing to do is to think of something else? I focused on Uncle's obiturary notice and tried to figure out where the five mentioned sons, my cousins ended up. While it was a great exercise in researching the available censuses, the distraction did not help me to remember what my illness had been. I see no reason why I shouldn't share with you what I figured out. 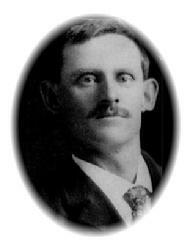 By 1900, Cousin John, 31, was married to Elizabeth. They had a daughter, 7 year old Alice and they lived in Union, NJ. Cousins Arthur, 30, and William, 27, were still at home. Alfred, 24, was married to Jennie. They remained in Belleville with their 7 year old son, Alfred. Walter, 20, was also living at home. It saddens me to think of the hard loss of their father but it made my heart glad to remember when I visited them and they showed me the wonders that New Jersey and the East coast offered. It also warmed me to see how Aunt Alice, in her bereavement, still managed to reach out and wished I would go back and visit soon. Eventually, I would. Those early years were joyous, indeed. Elsie kept a meticulous house while I continued my work with the Street Railway Company. We raised a lot of our own vegetables and some fruits. We had strawberries in abundance, more than we could ever use and we decided selling them would be a practical way to supplement our household income and help pay our taxes. They were a temptation, but Elsie and I were strict about not eating the profits. After the last of the harvest was sold; however whatever fruit remained, was ours. 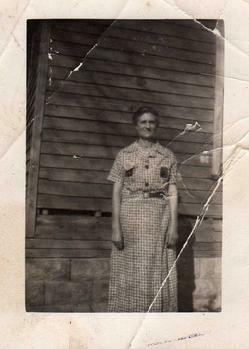 My sister, Mattie, who had long since left behind the idea of matrimony, continued to work as a housekeeper, a domestic, as she liked to refer to it and she worked for several families in the area. It kept her busy and she was happy with her life. Thelma was growing like a weed and she brought untold joy into our young family. It was a delight to watch her take her first steps, to see the amazement on her face with each new discovery. When she learned that she would soon become a big sister, she prepared herself to become mother�s helper with the new baby. On December 26, 1907, we welcomed the newest addition to our family, our son, Roy Wyatt who was named after my father, Thomas Wyatt, and also in memory of his brother, John Wyatt, the son we lost six years earlier. Roy was a big boy, a bruiser, as they say, and in my own secret proud papa way, I could tell he was going to grow into a man to contend with. A merrier Christmas we Sigleys had never celebrated�not only for the continuation of our family but for the joy two sets of pitter-pattering feet would bring into our growing home. By the time Elsie and I married, Richard Yates Jr. had held the office of the Governor of Illinois for eight months. His father, also Richard Yates, Sr., had been the thirteenth Governor of the state and served through the difficult Civil War era and was an outspoken opponent to slavery. Like his father, the younger Yates fought the injustice of racism. Specifically, during the Eldorado riots of 1902, he sent in the State militia to restore law and order when black faculty and students were confronted with a mob eager to run them out of town when a new black industrial training school opened in the town which lies about 130 miles southeast of St. Louis. Unfortunately, realizing they were not welcome, blacks left Eldorado and it became a sundown town�a place empty of black residents. Our town, Springfield, being the capital was a safer place for blacks, but mass racial violence was sadly also in our future. Disturbing as these events were, it was a way of life and one that was endured, if not accepted. It is no wonder, in light of the heroes of our early days, that our family has been against racially defamatory words and statements with such ardor; the current Sigleys can attest to that. Surrounded by this political climate, our home in the heart of the capitol seat of our state, Elsie and I prayed again for a child and on June 27, 1903, Elizabeth Thelma was born, whom we affectionately referred to, simply, as Thelma and our house once again was a home. Elsie and me with our pride and joy, Thelma, at about 3 years old. When we name the countless members of the Sigley family, there is one name that is very rarely mentioned. He never sat at his father�s knee, or ran away from his Mom after a rascal�s prank. Considering the numbers offered in the table below, it was no surprise that our first-born (six years prior to the earliest date available there) became an unfortunate commonplace statistic of the times. It was a rough blow to our plans to begin a family, but later, Elsie and I would gratefully rejoice in the births of more, healthy children, but we would never forget our first born, our angel, John Wyatt Sigley. A Simple Home. A History Lesson. I wish you could have seen our first home. Elsie and I became city dwellers since it was most convenient for my work on the Street Railroad. Eventually, we�d go back to our rural beginnings, but when first married, we made our home in Springfield�1403 Jackson Street�to be exact. You can�t see the actual home here except for the land where it stood, but trust me, Mrs. Sigley made it serious business to keep a tidy home worthy of its neighbors�make sure you check pages 2 and 3 to meet some of those neighbors. Many a warm evening after our supper, Elsie and I would joke that perhaps we should walk a mere few blocks and take our dessert with the Lincolns�long since gone from our neighborhood. Ah... that must have been an exciting time on our block�to have the President and Mrs. Lincoln just up the road a piece. However many years passed since they also worked and lived here, that family�s legacy is stamped throughout our fair city and many a monument to them is maintained and visited by folks from all over the world. 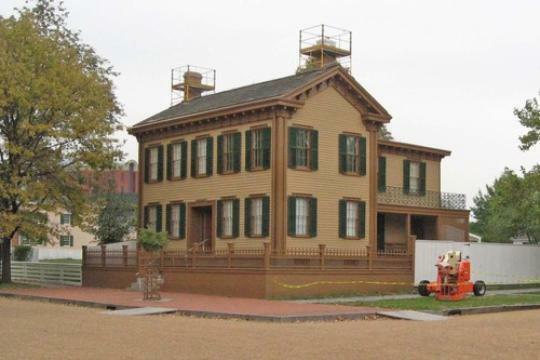 One of the most visited of the Lincoln sites (as they are referred to in your time) and of closest Sigley family significance is the Lincoln home. Occupied by the family until the presidential inauguration in 1861, it was deeded to the State of Illinois by Robert Lincoln in 1901. While we�re talking about our presidents, what kind of history buff are you? Did you know that our President McKinley was assassinated five days before Elsie and I got married. In our part of the country we�ve lived with first-hand knowledge that our presidents are assassination targets, but it nevertheless shook us up as we prepared for our wedding, as I recall. Always one to put things into perspective, President McKinley�s assassination�s effect on our nuptials could not be compared to what Robert Todd Lincoln must have felt. The poor guy was three for three. The night of his father�s assassination he stayed behind (some claim due to fatigue after a long covered wagon ride), otherwise Robert might have been sitting next to the President, or even been shot himself. James A. Garfield�s Secretary of State at the time, he witnessed his assassination at the 6th Street Train Station in Washington DC on July 2, 1881. Twenty years later, he attended the Pan-American Exposition in Buffalo, New York where McKinley was killed. The years closely preceding my marriage to Elsie, as they led to the turn of the century, were also defined by a political climate that, at least for our family and friends, highlighted our social calendars. I want to share some of the furor felt by my contemporaries. I remembered this letter from my sister Mattie, who was seventeen years old at the time, that I have not shared with you yet. As you can see by the Editor�s notes, I have hesitated from sharing it until I could ascertain if the part that may or may not be missing could be recovered. I�ve decided there is enough of it to share and want to make a comment or two, but first read it as dear Mattie wrote it to me on the Sunday night of November 4, 1885. Can you feel her interest in the different political events she lists? Or hear the cheering at those events? I can; and I can imagine her attentive viewing of the magical lantern�s war views. In today�s world of such enhanced visual entertainment where there is so much that has been invented and improved on since then that it�s easy to forget the simplicity of what started it all. 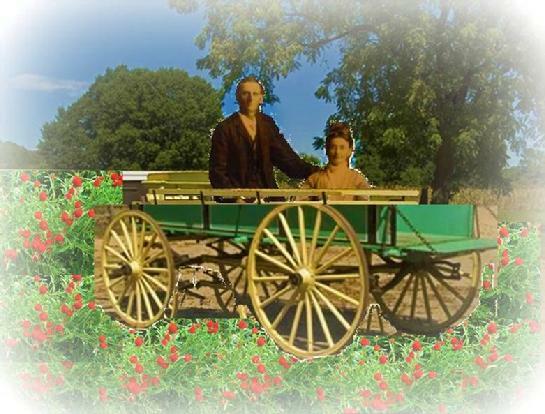 Friends, after my thirty-four years of established bachelorhood, Miss Mary Elsie O�Connor, the twenty-one year old, eldest daughter of Michael and Laura, O�Connor agreed to be my wife. Here she is pictured with her family. Dear readers, I present to you, newlyweds, John L. and Mary Elsie Sigley.